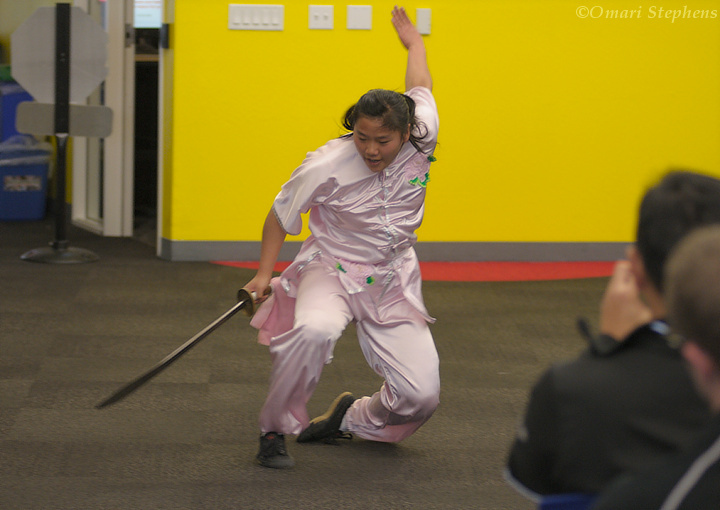 Last Wednesday, Master Shu Dong Li and five of his students presented a martial arts demonstration at Google. Having only seen a Wushu competition once, many years ago on television, it was a great experience to be able to watch in a more intimate environment, and to not only see but to also hear the practitioners and their weapons. 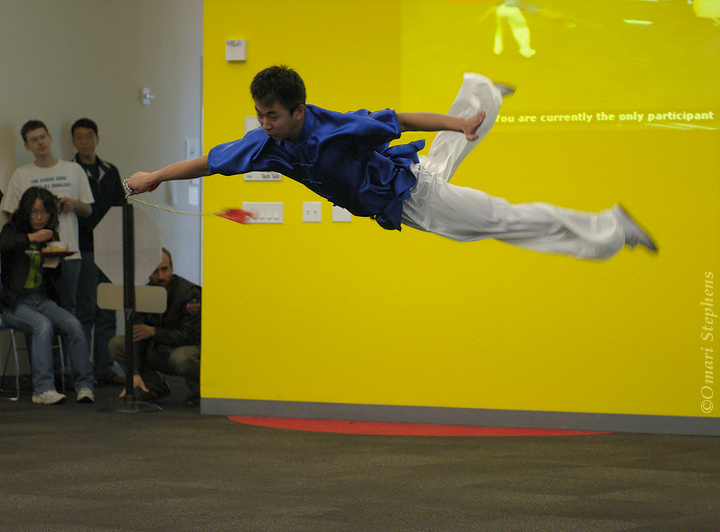 Here, Sifu Bide "Peter" Fu performs with a chain whip as some Googlers watch in the background. I enjoyed hearing the whirring from the dart at the end of the whip. That said, apart from the acrobatics, I had trouble seeing the skill involved. That's a good thing. Sifu Fu seemed to handle the chain whip as if he were born with one in his hand. Though the differences would likely become apparent when watching someone more or less experienced, he did a sufficiently good job that what mistakes he made were invisible to me. To borrow a saying from Arthur C. Clarke, "Any sufficiently advanced [technique] is indistinguishable from magic." Before the demonstrations, each of the students made a number of passes of the performance area, repeatedly demonstrating some form or technique during each pass. Their flexibility and strength were incredible. 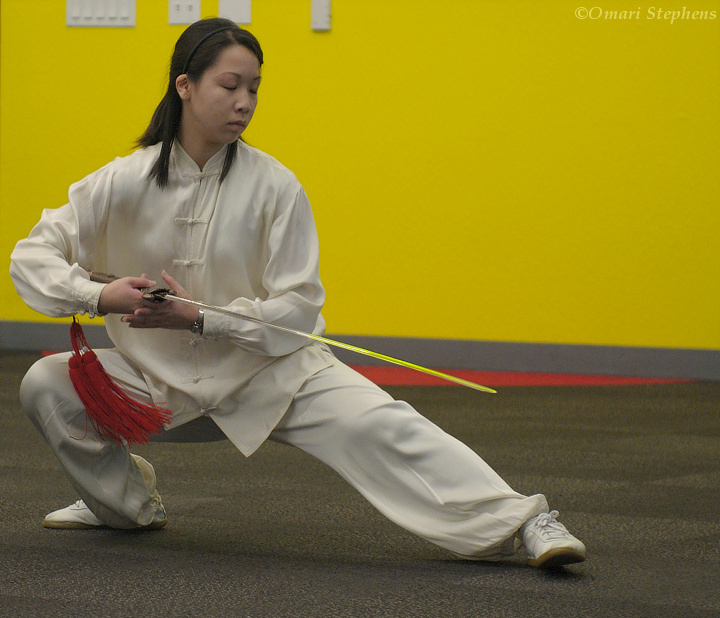 In addition to the warmup (pictured), Sifu Ao Li used this position during her Kung fu twin sword routine. According to this site, this is a fundamental Wushu position called Chaotiandeng, "the standing splits balance position." 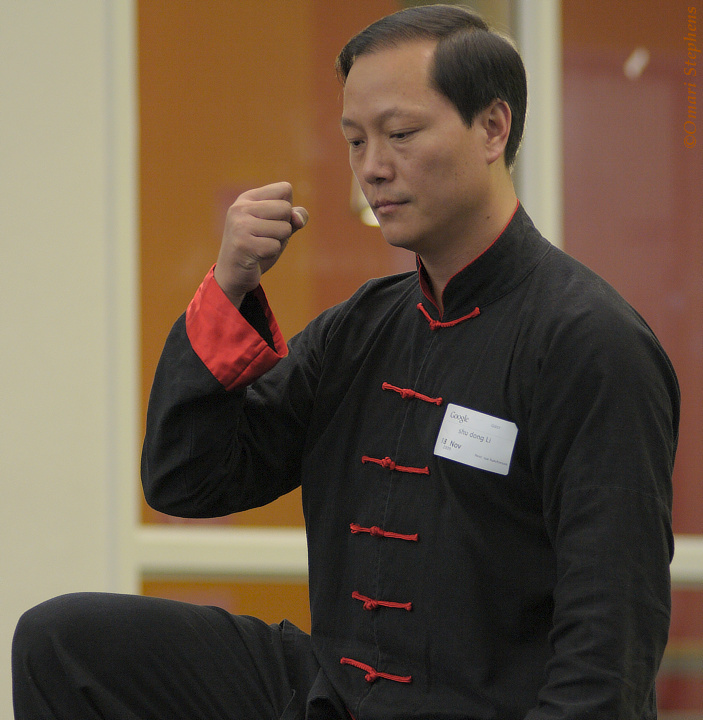 Sifu Yang Zhang performed a Kung fu sword demonstration. One thing that stood out to me, and which I continued to notice throughout the rest of the demonstrations, were that the different practitioners maintained different facial expressions during their performances, and especially so during performances with rapid movements. Here, Sifu Zhang comes out of a roll. The Tai Chi demonstrations were easily recognizable by their generally slow pace (though there were often moments with bursts of speed). Sifu Nhu Tran performed a Tai Chi sword routine that I greatly enjoyed. She appeared supremely tranquil, and I was at the same time impressed by her balance and coordination. 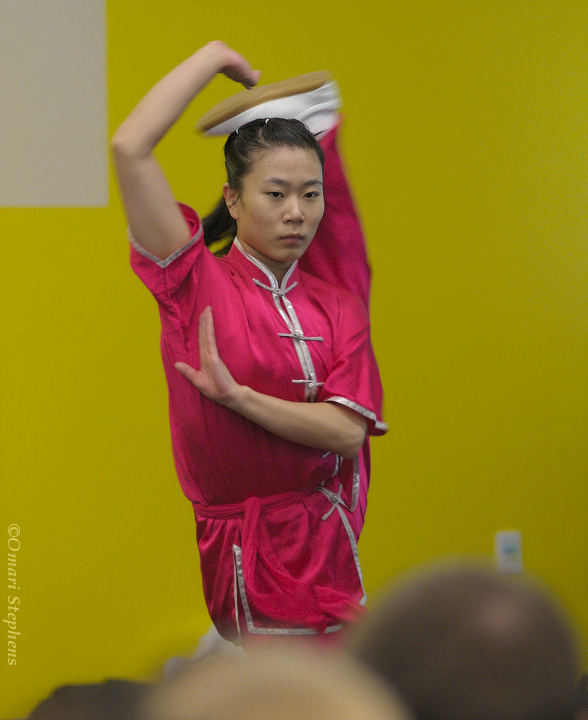 Master Li performed twice during the presentation, opening with a beginner-level Tai Chi hand form, and demonstrating an advanced Tai Chi form to conclude the event. What surprised me most about Master Li's advanced form were the body control and power required. During one technique he demonstrated, shown above, he gracefully but deftly moved to a position where he balanced on one leg, looking downward with his fist in front of his face. He paused in that position for a long moment, and then in a single quick, fluid motion raised his left hand and pounded his fist into it. The fascinating thing (for me, at least), was that there seemed to be no back-stroke, no stretch reflex. It seemed tantamount to kicking a soccer ball from a standing single-leg starting position, or throwing a football while keeping one's entire torso still. Thanks for looking. You can find more photos here.